The word himnas, which is what Lithuanians call their national anthem, comes from the Greek word hymnos, a holy and solemn song used to worship the gods in ancient times. Here we will focus on Lithuania’s current anthem, while mentioning songs that at one time or another were possible candidates for national anthem status. More than a century ago, the need for a Lithuanian national anthem was satisfied by the first line of Adam Mickewicz’s epic poem Pan Tadeusz: “Lithuania, my homeland, you are dearer to me than health…” During the years when the Lithuanian press was banned [1864 – 1904], a song by Antanas Baranauskas – “Nu Lietuva, nu Dauguva” – was very popular. This song sounded like a national anthem. It encouraged love of the homeland and burned with hatred for the czar and for russification with the words, “Aneirašto, anei druko mumsturėt neduoda…” (“They won’t let us have anything written, nor anything printed…”) Young people sang this song with great enthusiasm, as the writer Juozas Tumas-Vaižgantas noted. The czarist government considered this song to be hostile to the state and tried to ban it. Then an appeal was made to the Lithuanian poet Maironis to write new words to the same melody, so that the government censors would not find it objectionable. That is how the popular poem by Maironis called “Eina Garsas” (“A Call to Arms is Sounding”) came into being. Vincas Pietaris, the author of the well-known historical novel Algimantas, suggested that the psalm of David – “Dievas Galybių su Mumis!” (“The God of hosts is with us!”) – be turned into a national anthem. The hymn “Marija, Marija” was also very popular with the people. The composer Česlovas Sasnauskas wrote the music, and the words were by Maironis. In our time His Holiness Pope John Paul II especially liked this hymn. Another poem that was a possible candidate for Lithuania’s national anthem was “Kur Bėga Šešupė” (“Where Flows the Šešupė”) by Maironis. Česlovas Sasnauskas and Aleksandras Kačanauskas wrote the music for this poem. It contained the expressive and patriotic line,“Pirmyn į kovą už tėvynę, už brangią žemę Lietuvos!” (“Forward into battle for the homeland, for the dear land of Lithuania!”) This song even had a subtitle that said, “Lithuania’s National Anthem.” The song called “Jaunimo Giesmė” (“The Song of Youth”) composed by Juozas Naujalis was also very popular. It had the line, “Užtrauksim naują giesmę, broliai, kurią jaunimas tesupras!” (“Brothers, let’s sing a new song, that only the young will understand!”). 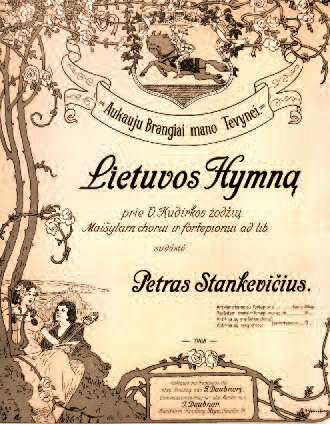 Sheet music featuring the national anthem(Lietuvos Hymnas). A poem by Jurgis Sauerveinas entitled, “Lietuvininkai Mes Esam Gimę” (“Lithuanians We Were Born”), became a national hymn as well. It was published in 1879 in a Klaipėda newspaper called Lietuviškas Ceitungas. With some editorial changes, this poem (set to music byStasys Šimkus) is now called the national anthem of Lithuania Minor. Vincas Kudirka in describing his song, “Tautiška Giesmė” (“National hymn”), said prophetically that he had written an anthem for Lithuanians. The “National hymn” was sung for the first time when Vincas Kudirka was close to dying. That was on November 13, 1899, during a concert in St. Petersburg held as a fund-raiser for Lithuanian students. A year later, Kazys Grinius, a good friend of Vincas Kudirka, referred to the hymn as a national anthem in the press. He sought to propagate it at family gatherings and various meetings. People would stand while singing this hymn, as is proper for a national anthem. The hymn was sung at a special concert on the eve of the first session of the Congress of Vilnius. It received an especially enthusiastic reception, and it received the respect appropriate for a national anthem. The chorus, under the direction of the composer Mikas Petrauskas, had to perform the hymn several times. 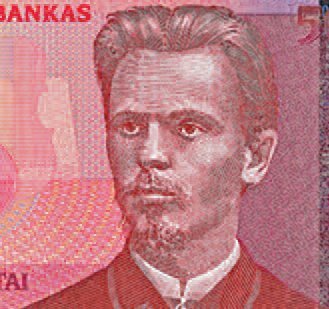 In 1906 sheet music published at the behest of composer Antanas Kačanauskas referred directly to the national anthem or hymn of Lithuania. The title was, “Lietuvių Hymnas. Žodžiai ir melodija V. Kudirkos. Fortepijonui priruošė A. Kačanovskis.” (“The Lithuanian Hymn. Words and music by V. Kudirka. Piano part prepared by A. Kačanovskis.”). The old symbol of national sovereignty the Vytis decorated the cover of the publication. …a group of Lithuanians began singing together, and everyone in the room stood up in unison because it was the national Lithuanian anthem that was being sung. The melody grabbed everyone’s heart and emotions because they all remembered a time not long ago when people would whisper the words, “Lietuva, Tėvyne mūsų” (“Lithuania, our homeland”), in fear. At the same time, our hearts were filled with joy at the realization that finally we had achieved at least enough freedom to be able to sing those words out loud in public. Singing Lithuania’s national anthem fostered patriotism in the hearts of Lithuanians as well as hope and desire to take part in the restoration of the country. It encouraged doubters to take the Lithuanian path. According to Jadvyga Čiurlionytė, the anthem composed by Vincas Kudirka influenced her brother, the famous Lithuanian composer and artist Mikalojus Konstantinas Čiurlionis, and his whole family to recover their Lithuanian identity. 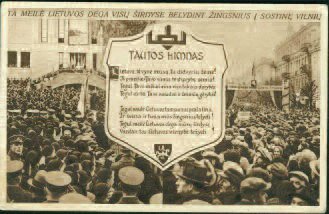 The Lithuanian national anthem resounded grandly at the Lithuanian conference in Vilnius in August of 1917. This conference elected the Lithuanian Council, which was empowered to proclaim the reestablishment of the Lithuanian state. The national anthem composed by Vincas Kudirka was sung with great joy and solemnity on May 15, 1920, in the Kaunas Musical Theater Hall. Here Lithuania’s Constitutional Congress held its first meeting. The president of the Congress, Aleksandras Stulginskis, read the unanimously adopted Declaration of Lithuania’s Independence as all the participants stood at attention. That day is considered the day when the “Tautiška Giesmė” (“National Hymn”) officially became Lithuania’s national anthem. It also became a symbol of an independent Lithuania, and because of its popularity, no formal codification was necessary; it was not mentioned in any of the prewar constitutions of Lithuania. When the Soviets occupied Lithuania and after the so-called “election of the people’s congress,” Lithuanian radio was forced to transmit the sounds of the towers of the Kremlin at 10 p.m. each evening; at midnight it was required to sign off by playing the “Internationale.” However, as it was being pushed out of public life, the Lithuanian national anthem became a symbol of national resistance. This became especially evident in August of 1940, at a conference of Lithuania’s teachers held in the Kaunas Sports Center. The teachers were required to sing the “Internationale,” but instead they stood up and sang the Lithuanian national anthem. The servants of Moscow who were seated at the head table did not know what to do. Some stood, some sat, they felt as if they were out of place. Antanas Venclova, who was the People’s Commissar of Education at that time, wrote: “As many as 10,000 educators participated in the teachers’conference, or as many called it the teachers’ congress […] The enemies of the new order were afraid of expressing their views. However, asthe conference was concluding, they found a way of reminding everyone of their existence they got up and sang the national anthem of bourgeois Lithuania.” That is how teachers demonstrated their patriotism and loyalty to Lithuania. The Lithuanian national anthem was broadcast on June 23, 1941, when Lithuanians revolted and took over the Kaunas radio station. Many people listened to the Lithuanian national anthem then with tears in their eyes. 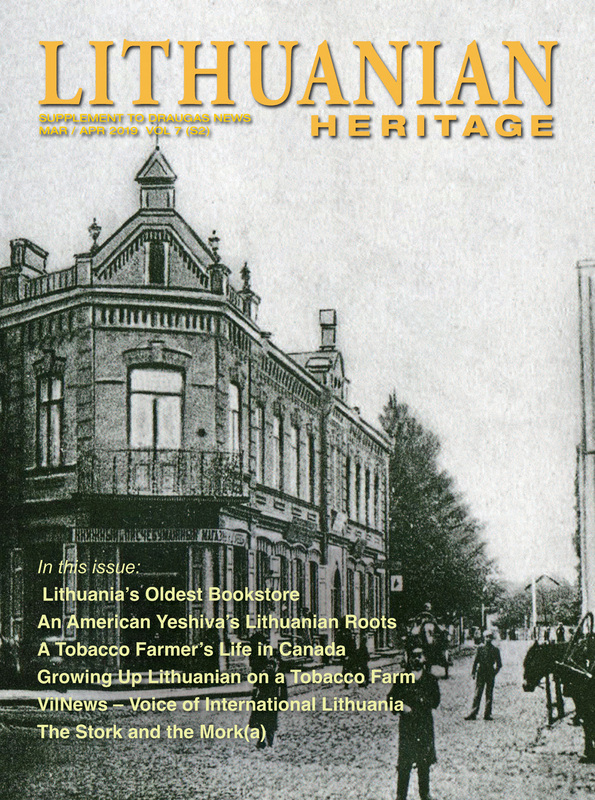 During the second Soviet occupation, singing of the Lithuanian national anthem was permitted for a while. 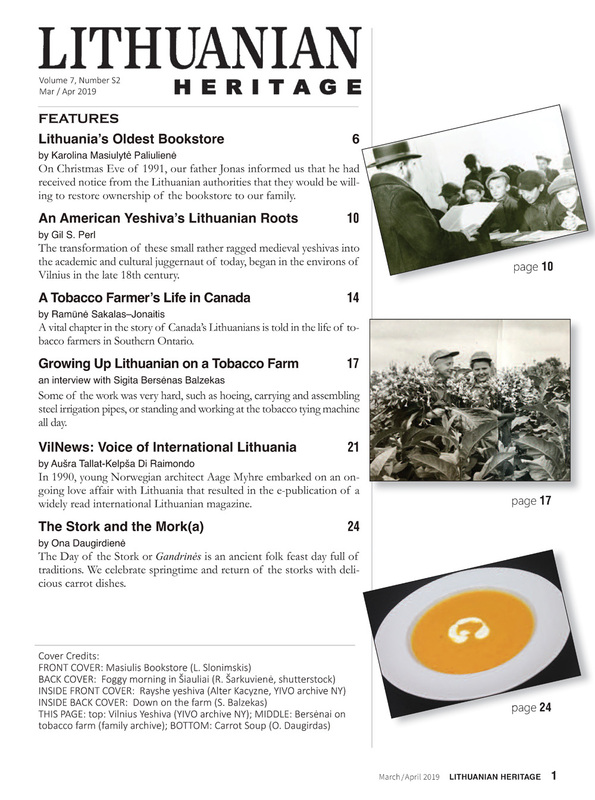 However, in 1945 a commission to “prepare a national anthem for the Lithuanian SSR” was created. The commission was required to complete its work by January 1, 1946. However, the Soviet government delayed adopting the alternative Lithuanian SSR anthem, which itslackeys had composed, because it did not want to increase tensions, especially because of the active partisan resistance to Soviet occupation going on at the time. Meanwhile in Latvia and Estonia, where resistance was much weaker, new anthems were adopted in 1945. The Lithuanian SSR anthem, which sang the praises of the Soviet occupation, was adopted in July of 1950. Antanas Venclova wrote the words. The music was by Balys Dvarionas and Jonas Švedas. After the atrocities of Stalin were made public, the anthem was revised: Vacys Reimeris wrote new words and Eduardas Balsys wrote new music for it. Despite the winds of occupation which continued to blow, the sounds of Lithuania’s national anthem were heard ever more clearly as the years went by. People would sing it more often in public places. One memorable instance was in 1988. On February 14th, it was sung in the Cathedral of Kaunas, and on February 16th, in the square in front of the Cathedral of Vilnius. The national anthem rang out during the commemorations of the deportations of June 1941, as well as during other important events that the Sąjūdis movement had organized. Finally on October 6, 1988, the “Tautiška Giesmė” (“National Hymn”) written by Vincas Kudirka received official recognition, and on November 18, 1988, it was adopted as the national anthem. On October 7, 1988, the sounds of the Lithuanian national anthem accompanied the raising of the three-colored flag of Lithuania over Gediminas Tower in Vilnius. Two days later the Lithuanian national anthem was sung as our flag was raised above the bell tower of the War Museum of Vytautas the Great in Kaunas. On the evening of March 11, 1990, when the restoration of Lithuania’s independence was proclaimed, the Lithuanian national anthem was sung with solemnity. in Vincas Kudirka square in Vilnius. It is good to remember the honorable history of our national anthem and its final triumph. Now the “Tautiška Giesmė” of Vincas Kudirka is officially named the national anthem of Lithuania in section I, paragraph 16 of the Constitution of the Republic of Lithuania. In 2009 sculptor Arūnas Sakalauskas created a monument to the national anthem. (The architect was Ričardas Krištapavičius.) 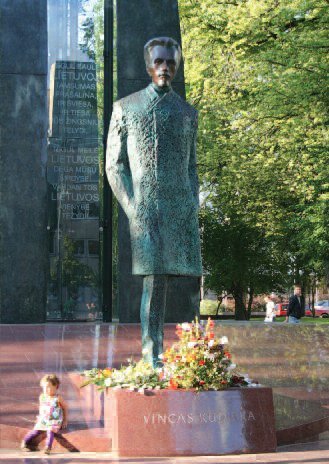 Arūnas Sakalauskas also sculpted a monument to Vincas Kudirka, the author of the national anthem. This monument stands in aptly named Vincas Kudirka Square in Vilnius. It is in front of the building that houses the government of the Republic of Lithuania. When the monument was unveiled, Lithuanians from around the world sang the national anthem as a sign of unityand love for Lithuania. This singing gave rise to a new tradition which unites Lithuanians: each year on the government holiday commemorating the crowning of Mindaugas king of Lithuania, all Lithuanians, no matter where they may be, sing the national anthem of Lithuania at one designated time. The national anthem is very important for the people of Lithuania because it symbolizes freedom and the dignity of our country, and it reminds us that we have to love our country. The national anthem maintains our patriotism and our trust. When I sing the national anthem, a pride in my country and its history arises in my heart. This hymn demonstrates that our country is united, that it is most beautiful and sincere. The hymn unites us. We ought to sing it more often. We would like the anthem to light the paths of our lives, to help us not to get lost in life’s byways. We hope that the Lithuanian national anthem will be sung at least once a week in all schools, and that the symbols of our country will be respected with sincerity. Let us build a bright and just Lithuania!